Let's assume, just for fun, that Microsoft really is going to announce its own tablet on Monday. There are only two questions we should be asking ourselves: would it be a good idea? Or would it be the best idea? All we know for sure is that Microsoft has an event on Monday, in Los Angeles, and that it's going to be major. But that doesn't mean we can't deduce; Microsoft's Windows Phonapalooza is that Wednesday, so any look at the next generation of live tiles will wait until then. Making this much ado about its Yammer acquisition would be a cry for help. And Windows 8 is already pretty much a done deal. Process of elimination, then, doesn't leave us with many options. A new phone? Doesn't seem likely; Microsoft's still in a big comfy bed with Nokia. And while Lumia 900 sales haven't been what either company might have hoped, the product itself doesn't have the kind of glaring faults that might spur a break-up. A star-studded preview of Office 87? See: Yammer sadness. Steve Ballmer is going to fly around in a jetpack giving blogger-wedgies for an hour. 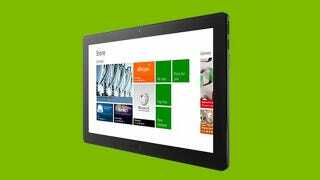 Microsoft is finally, more than two years after the iPad, going to introduce a tablet. I'd rather see the first. But I'm pretty sure it's the second. So a tablet, sure! It's about time. But remember, this isn't just any tablet that's being rumored. It's a Microsoft tablet. Built from the ground up in Redmond. And why is that so important, again? Because that might be the only way Microsoft can win. If you were about to enter the tablet market, who would you rather emulate? Apple, with its cohesive ecosystem and Scrooge McDuckian money piles? Or Android, whose offerings are as muddled as a Pollock—and about as functional, too. Remember, too, that Microsoft's Windows Mobile wounds are still fresh. It trusted its hardware partners too much, and paid the price. It's shown with Windows Phone—in the form of strict hardware requirements—that it won't make that mistake again. It's a no-brainer. When Google wants to build its platonic ideal of an Android tablet, it has to ask Asus very nicely and trust that it'll go well and that its other hardware partners won't be pissy about it. Apple, meanwhile, just goes ahead and builds itself an iPad. Microsoft's clearly got the resources, the determination, and the built-in user base to go it alone. It's even had some practice. And it's demonstrated that it has the most important thing of all: patience. Is This Google&apos;s Nexus Tablet? Over a decade ago, Microsoft wasn't a gaming company. It wasn't a hardware company. But it saw that gaming was a profitable business, that people's living rooms were where the next generation of computing was taking place. So it built itself an Xbox. At the time, Microsoft was facing two entrenched powerhouses: Sony and Nintendo. Both had rabid fan bases. Both had exclusive titles that propelled sales. But Microsoft was willing to sell each unit for a huge loss to build market share. It offered innovative online features that locked people into its ecosystem. Oh, and Halo. The parallels aren't exact, but they're clear enough. Microsoft learned with Xbox that you can't just dip your toe into a new market, you have to make the biggest splash you can muster. And while that first console took a while to catch on—particularly overseas—today, every other console sold in the US is an Xbox. Microsoft can afford to play the long game. The success of Xbox has been its model for Bing. It provided the framework for Windows Phone, although Nokia has been a problematic surrogate. And it will—or at least, it should—light the way for its tablet efforts as well. So look again at the tablet market. Two entrenched powerhouses, both with rabid fan bases and established ecosystems. All of Microsoft's PC friends are busy making Android tablets already, and the ones that aren't don't have the best track record lately. Meanwhile, look at Microsoft: still willing to take huge short-term losses (see: Windows Phone) in hopes of long-term gains. Content deals long in place from its Zune misadventures. A huge investment in Nook that gives it an instant iBooks and Kindle competitor. An operating system that feels different and good and fun. Hundreds of millions of established Windows users around the world. We don't know what Microsoft is announcing Monday. But if it's a tablet, and if that tablet is home made? That could be the smartest thing to come out of Redmond since its little black Xbox.